For individuals working in corporate, the story is pretty much the same and the reasons for a sedentary lifestyle is also no different. Aasish Kumar’s story hence was no different. On and off he would try his hand at a physical activity like playing a sport, go for a jog but it was not consistent and there was no discipline maintained. But, one fine day he realized let’s try and make a change. Since that day and today, life has a come a full circle for Aasish. He has lost about 9 kgs from 83+kgs to about 75Kgs in just about 6 months and is much fitter and agile. Aasish’s story in his own words…. I work for a corporate and my job is a desk job. It does not require me to move too much. In other words, it’s predominantly sedentary work as far as my job is concerned. Given that work was stationary, my lifestyle was also inactive with no physical activity whatsoever. I tried playing a sport, go for a jog sometimes, and went to a gym but only for few days. Secondly, my food habits were also erratic. I never monitored or bothered much about what I ate. I was not consistent and disciplined in anything I was doing. And all of this was eventually affecting my health. I was aware of my problem but, did not know where to start and how to rectify the problem. Sometime last year during the first half of the year, I attended a conference organized by my organization. At the conference, as a part of promoting healthy lifestyle we all were given a GOQii band. I did not use the band for quite some time. Then one day, I decided to pick the box and read about GOQii and its offerings. I decided to give it a try. I registered on the app and I got Amee Chandarana as my coach. I started with setting 2-3 health goals to achieve. One of the most important health goals was to reduce my weight but the same time I wanted to do it in a healthy way. I wanted to improve my eating habits and get more disciplined. I was looking for professional guidance with respect to how to integrate various aspects of lifestyle i.e. food, water, exercise, various forms of physical activity that you can take on and start off gradually your path to health and fitness. Starting month was difficult for me to suddenly make changes to my lifestyle and adjust to all the exercising etc. But, once I got used to it, I got hooked on to GOQii. I got into a rhythm of using the device and the coach. I wanted to ensure that I stick to my plans and bring about a positive change in me that will in return make a real difference to my lifestyle. Today, I have a regular workout regime wherein I train in the gym with my personal trainer with one day of rest. I supplement the gym training with the information that I get from my GOQii coach. GOQii has helped me both on the app front as well as on the coaching front. On the app front, I am able to track my fitness, food, water, sleep progress on a daily basis. This is helping me to self-regulate myself and have a disciplined life. I started my coaching some 3 weeks after I started using the app. With regard to coaching 2-3 things come to my mind. Firstly, there is someone who is keeping a track of what you are doing and equally interested in what you want to achieve as an individual with respect to lifestyle. Secondly, you are getting important tips from your coach on how you can change your diet by reducing sugar, increasing the water intake, a mix of food that you can have and lastly, your coach also motivates you to clock your 10,000 steps daily. After being able to clock 10,000 steps easily on a daily basis you are motivated to go to the next level. For instance, I started with 10,000 steps initially today, I am easily able to clock 12,000 to 15,000 steps daily. The coaching does not end with just this, you also get tips on various forms of exercises, yoga, food, etc. It’s a holistic approach with respect to all aspects of lifestyle. It focuses a lot on your health goals and how to achieve this is in a said period of time that you have set for yourself. Thanks to the coaching I have been able to shed about 9 kgs in the last 6 months. I was at 83+ kgs when I came on board the GOQii platform and now my weight is around 75 kgs. My target is to reach 70kgs and I am moving towards this target. People around me have also seen the change in me. They find me energetic and positive now and are surprised with my change. They are surprised about the disciplined lifestyle that I follow. The time I got the GOQii band, a lot of my colleagues also got but nobody was using it the way I am and now they are surprised at the outcome. 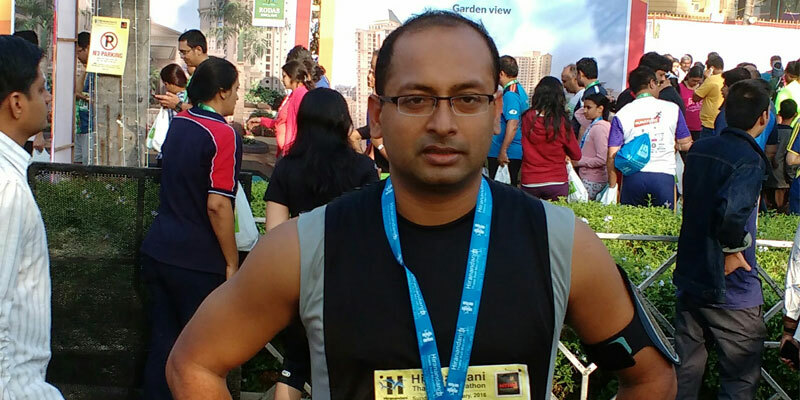 The best part of the GOQii training is that I have been able to run half marathons without putting in any extra efforts to train. I have been able to do it with my regular workout regime. My overall fitness has improved drastically and that has helped me improve my half marathon time. I have cut down my time by half hour. I finished the half marathon in February in 2:12:50 seconds. That according to me is a super cool improvement. The journey from the start has been remarkable. With small healthy changes like improving water intake to eating in intervals have been finely adapted by Aasish. He is very enthusiastic and determined towards his goals. We also together worked towards running the half-marathon and he successfully completed in 2:12:50 as against his last year’s timing of 2:43:45. 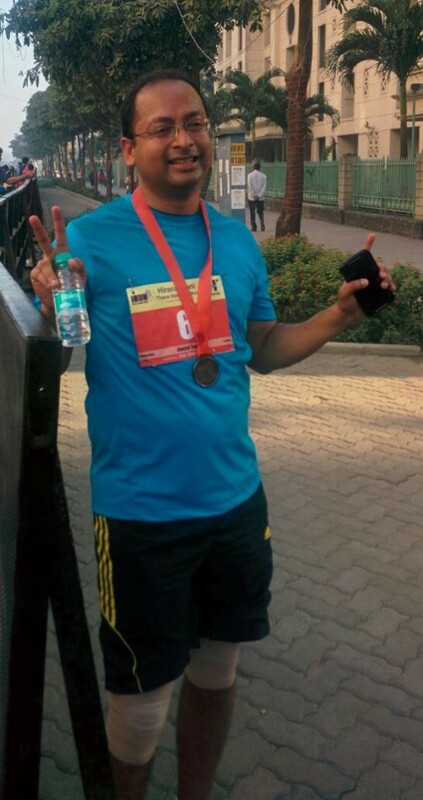 The next 10 km run for a cause he targeted to finish in1:10 but nailed it in 1:4 without any injuries. Overall, Aasish makes sure he follows the healthy routine to keep him fit and going.